Strawberry season will be upon us soon, for which I am always excited. When the kids were little we would take them to a local pick your own strawberry farm where the kids would pick and eat strawberries till their cheeks and chins were dripping and sticky and their baskets were overflowing! 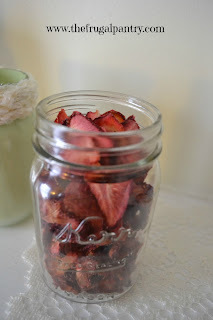 After making some strawberry jam, I always seemed to still need to find ways to preserve those fresh strawberries so that we could enjoy them year round while they were at the cheapest price possible. 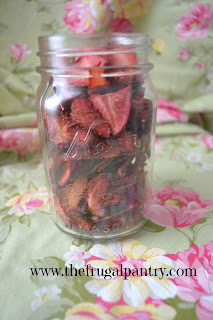 Besides freezing them, I have grown to love dehydrating them. 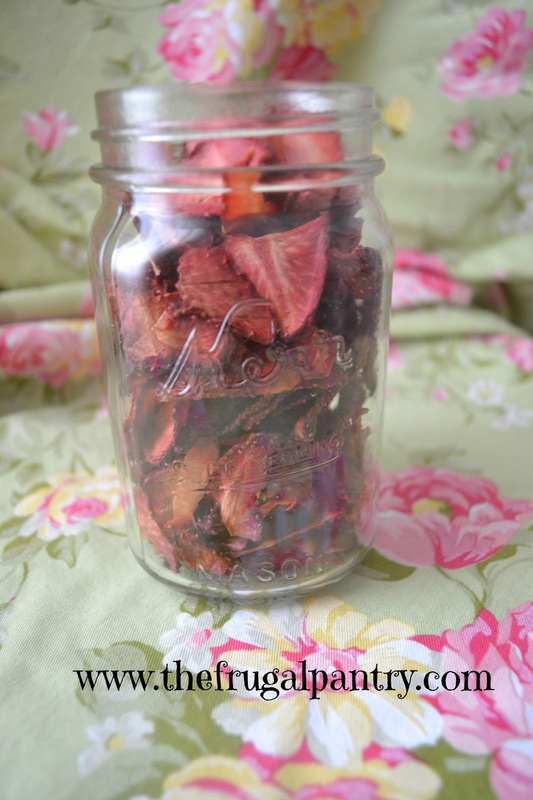 1) Once dehydrated they take up very little space. 2 quarts of fresh strawberries made just over 1 pint of dried slices for me. Strawberries is one of the fruits that retains is color when drying so you do not need to use a pretreatment on them before hand like some foods. You can just slice and dry. If you want the strawberries to have an even sweeter taste, you can blanch the fresh strawberries ( I would slice them first) in a sugar syrup first before drying. To do this follow this recipe from voices.yahoo.com :" Mix 1 cup sugar, 1 cup white corn syrup and 2 cups of water in a saucepan. Bring to a boil and add sliced fruit. Simmer for 10 minutes. Remove the pan from the heat and allow to rest for 30 to 45 minutes. Drain the syrup from the fruit." My husband is diabetic so I do not do the sugar syrup, they taste perfectly like fresh strawberries with out it to us. Try to slice them in even slices so they will dry at the same rate. I just used a paring knife, but a mandolin slicer would be more precise. 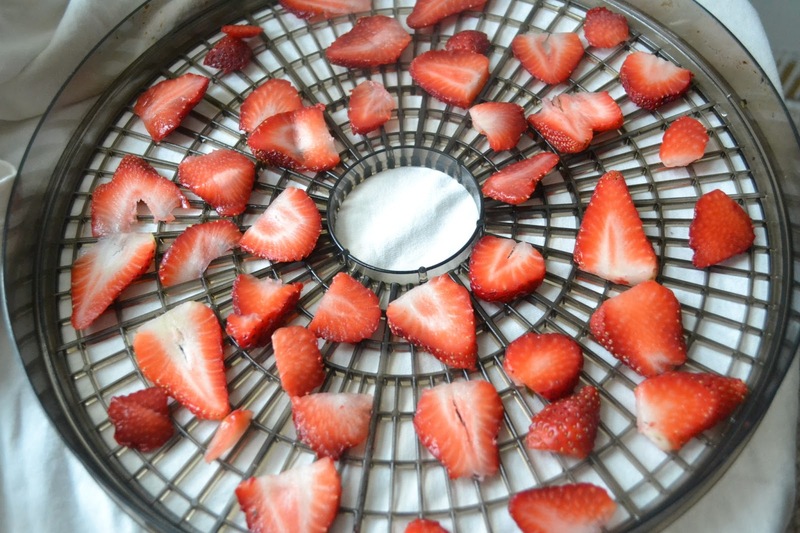 Spread slices evenly on your dehydrator screens, leaving room around each slice for air flow. If your dehydrator came with a manuel follow the drying temperatures and times. Mine was a used one and has no temperature control or manual. Usually around 130 degrees. The times can vary between 6-12 hours but mine is older and actually took more like 15 hours so my temperature is a lot lower than that. 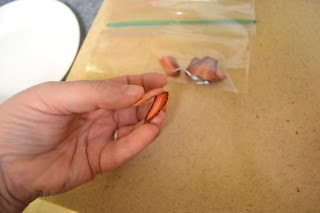 1) take a few slices from the dehydrator and place them in a plastic baggie. Fold the top of the bag over and watch to see if moisture or condensation forms. If it does, they are NOT dry yet, return them to the dehydrator for more time. 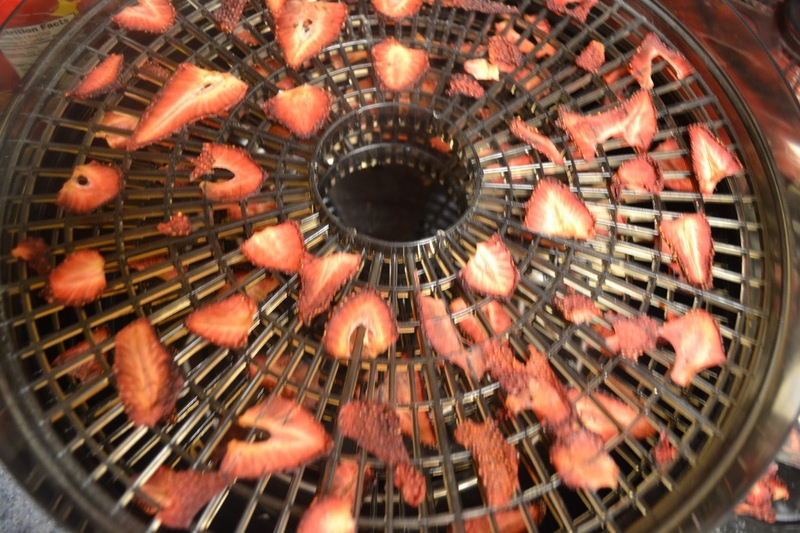 2) Remove a slice from the dehydrator and let it cool. Tear it apart and check along the tear line for little dots of moisture. If none appear then it is fully dry. Store in airtight containers or bags. Best in cool temperatures between 60 degrees and below freezing. Away from direct sun light. I store mine in a bag in the door of the freezer. Should last approximately 12 months.